Another magnificent resin release - no casting blocks, no pinholes, near-perfect fit! As the Fleet Air Arm was separated from the RAF, they sought their own fighter to be compatible with carrier operations. Current production designs were adapted into such as the Supermarine Seafire. While a capable fighter, the narrow landing gear was not ideal for arresting about a pitching and rolling carrier deck. The Hawker Company had produced a wide array of hard-working and durable for the RAF prior to, and during the Second World War. One design under consideration was a lightweight fighter designated Fury. Hawker offered a navalized version that would become the Sea Fury. The aircraft was powered by the Centaurus radial engine rated at 2480 horsepower. While the Sea Fury entered service too late for World War II, it did see combat over Korea as well as conducting operations in the Suez crisis. While the Sea Fury would be the Royal Navy's last piston fighter, the Sea Fury would soldier on in a variety of international air forces and can still be found at airshows or as one of the most popular air racers. 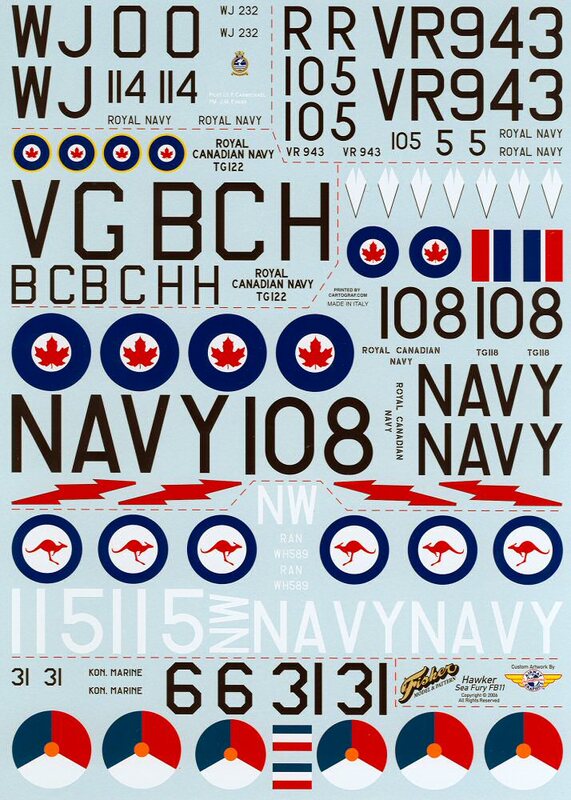 Ever since Paul Fisher announced his next offering after his three Grumman F9F kits, I've been anxiously awaiting the release of probably the nicest kit to come from his workshop. We've seen photos of test shots during its development and even a build-up on display at the IPMS/USA National Convention in Kansas City. None of that does this kit justice. 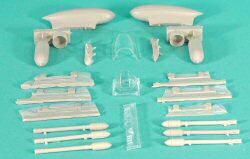 The kit comes in the same rugged box that was used for the F9F series and each major part is carefully wrapped in tissue paper. Small bags of parts were also carefully packed. None of the parts in my kit were damaged. Like the F9F, the fuselage is hollow-cast resin and is one-piece. That translates into no seams to fill or file. There are also no casting blocks on the major parts and while the smaller parts do come on casting blocks, they'll be easy to remove and actually help protect them from damage. The wing is a two-part affair. The underside center section used to be integral with the rest of the wing, but evidently the resin molds were having problems casting parts of consistent thickness with the old design. 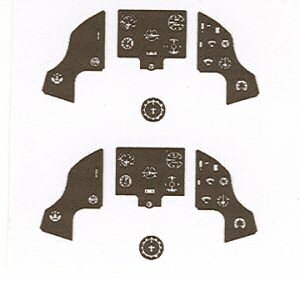 The solution was keep the wing parts thinner and this also allowed for separate wheel wells. Dry-fitting the wing parts showed a nice fit, I doubt much of any filler will be needed. Ditto with the wing/fuselage joint as you can see in the photo to the right. The cockpit was designed by Roy Sutherland of Cooper Details (and the chief designer for 21st Century Toys). Since the Sea Fury is a favorite of Roy's, the cockpit detailing is some of the best I've seen. 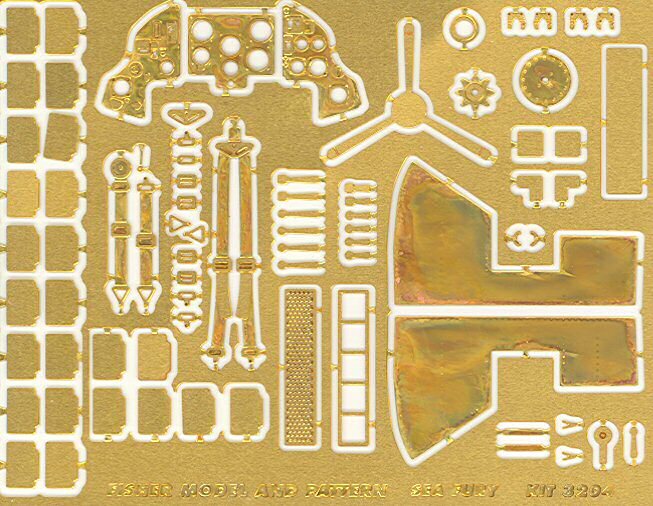 The resin parts are augmented by photo-etch and instruments are printed on acetate or paper. I have the paper version and I like them! The five-bladed propeller comes with a jig (not pictured here) to help set the angle and pitch of the blades when placed on the spinner hub. This is a very nice touch! The engine looks a little simple until you remember that when the spinner and prop sit in front of the small opening in the cowling, you won't be seeing much in there anyway. The rudder is molded integral with the vertical stabilizer, whilst the ailerons and elevators are provided separately. 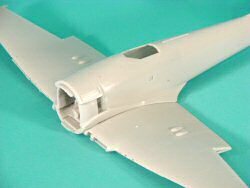 Parts are also provided to fold the wings, so you'll have nice wing interior and folding mechanism to show off your Sea Fury within a more constrained display area. 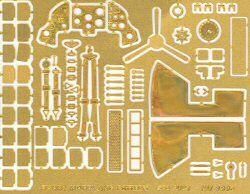 Landing gear is cast in brass by none other than Ernie Gee of G-Factor (if you haven't already seen the other beautiful landing gear sets that he has developed). 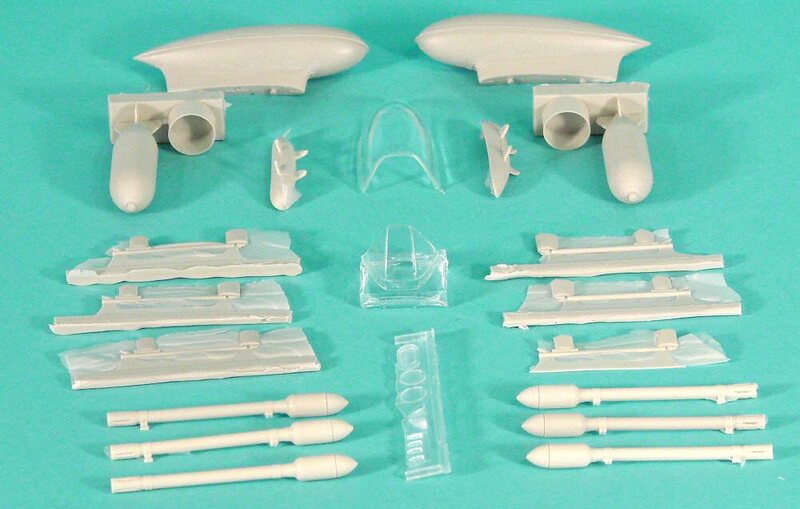 The external weapons options include a pair of bombs, six rocket rails with rockets, and two external tanks. The missing stencil instructions are provided to the right. This is a magnificent kit that will build into a show stopper. 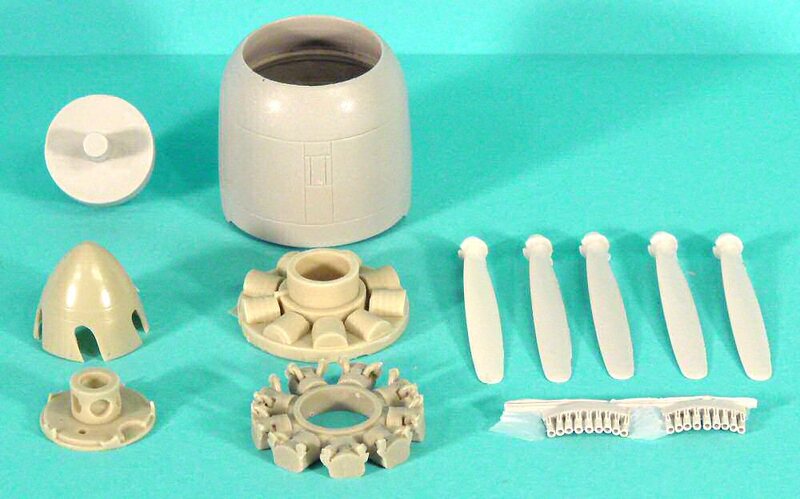 While some people may be put off by the retail price, remember that a 1/32 Trumpeter styrene kit isn't much cheaper than the Fisher line of resin aircraft. This one is definitely highly recommended! 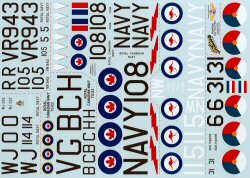 I bought my kit directly from Fisher Model and Pattern.